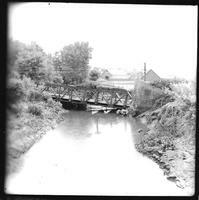 A small wooden foot bridge over the Silver Creek. during 1947 flood. This photo shows the southeastern side of Malvern. 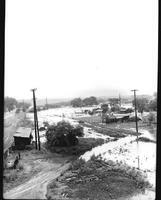 After the 1947 flood. 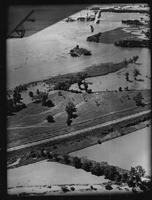 This is an aerial photo of the Malvern area in Mills county after the 1947 flood. 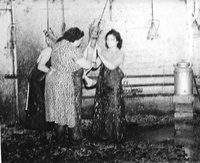 Photo postcard of a farm demonstration using an Avery Tractor on the W.S. Summers Farm near Malvern. The man at the end of the table next to wagon is Mr. Will Axtell. Scene is at the Axtell Apple Orchard NW of Malvern. Photo shows interior of the barber shop in Malvern, IA owned by Eli Springer. Second barber is Bill Thomas. Chicken plucking at Malvern Cold Storage Co.